Using a smattering ofRussian and domestic technology, South Korea launched a small rocket towardEarth orbit Tuesday, a significant first in the country's infant space program. Korean media outletsimmediately hailed thelaunch as a success, but it may take up to 13 hours for the mission's smallpayload to radio home. Official tracking data on the satellite was alsounavailable early Tuesday. The milestone mission beganwith launch at 0800 GMT (4 a.m. EDT) Tuesday from the new Naro Space Center onthe southern flank of the Korean peninsula. 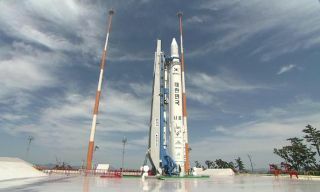 Liftoff was at 5 p.m. localtime in South Korea. The first launch attemptwas scrubbedlast week when falty software triggered an automatic abort with less thaneight minutes left in the countdown. Engineers removed the rocket from the padfor a few days as officials analyzed the issue. The rocket returned to thecliffside pad on Sunday. The 108-foot-tall Korea Space Launch Vehiclewas pushed skyward by a Russian main engine, seemingly listing back and forthas the icy white booster soared into clear blue skies and disappeared from viewover the Sea of Japan. Within four minutes, thekerosene-burning RD-191 engine was supposed to guide the rocket from itsoceanfront launch pad to more than 120 miles high. The Russian-built firststage was programmed to separate from the KSLV's second stage a few secondslater. After coasting to analtitude of nearly 190 miles, the Korean-made upper stage was to ignite andconsume its load of solid propellant in less than a minute to reach the blazingspeed necessary to achieve Earth orbit. Plans called for thelauncher to deploy its small 219-pound payload at the nine-minute point. Tracking data on thespacecraft, called STSAT 2, was not immediately available Wednesday morning toconfirm its actual orbital parameters. About the size of a washingmachine, STSAT 2 carries a microwave radiometer to measure radiation energy inEarth's atmosphere. The small satellite also has a laser reflector system toallow ground stations to precisely track its orbit. In the making since 2002,the Naro 1 rocket's development was a partnership between KARI and Moscow-basedKhrunichev, the Russian aerospace giant that builds the Proton booster. Khrunichev providedhardware for the rocket's first stage, which is based on the Universal RocketModule the company developed for Russia's new Angara line of rockets. The Angara launchers, whichRussia hopes will eventually launch a wide range of spacecraft, have beenafflicted with numerous delays and the rocket's lower half first flew fromSouth Korea. The stage is powered by anRD-191 engine based on similar powerplants with near-stellar records on theZenit and Atlas 5 rockets. The Naro 1 rocket cost morethan $400 million to design, build and test, but South Korean officials wereopenly wary of their odds for success before launch. Leaders said they expectedthe rocket could fail because many new vehicles experience problems duringlaunch, according to news reports. Tuesday's flight was topropel North Korea into an elite group of nations that have successfullylaunched rockets into orbit. South Korea would becomethe 10th country to achieve that mark since the Space Age dawned with theSoviet Union's launch of Sputnik in 1957. The United States followed with thelaunch of Explorer 1 the next year. France, Japan, China, theUnited Kingdom, India and Israel later developed and successfully flew theirown space launches in the 1960s, 1970s and 1980s. Iran joined the club inFebruary when it launched an experimental communications satellite with a Safir2 rocket. Tuesday's rocket launchprovided an enormous boost to the country's psyche after last week's death offormer President Kim Dae-jung. North Korea, whichreportedly attempted a failed satellite launch in April, criticized theinternational response to South Korea's foray into the launch arena. There was an outcry fromthe international community following North Korea's launch, which U.S.officials said was likely a disguised missile test. "The South Koreanshave developed their program in a very open and transparent way and in keepingwith the international agreements that they have signed onto," said U.S.State Department spokesman Ian Kelly. "This is in starkcontrast to the example set by North Korea, which has not abided by itsinternational agreements," Kelly said in a press briefing last week.